This Sunday, September 27, the 30th Annual Continental Airlines 5th Avenue Mile will be held. On the men's side, former Villanova all-american and NCAA 3000 meter champion Adrian Blincoe will take the charge down 5th Avenue. His track mile PR is 3:54.40, although he is a 5000 meter guy. 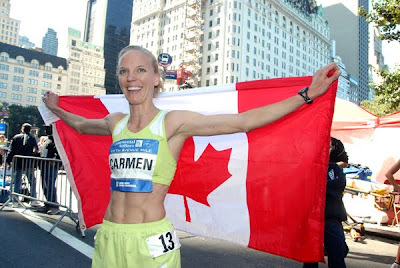 On the women's end, two-time 5th Avenue Mile winner and multiple NCAA champion Carmen Douma-Hussar will attempt to capture her third title. Both fields are packed with top-quality milers.